At the NBA Awards Show on Monday night, Houston Rockets guard Eric Gordon was named the 2016-17 NBA Sixth Man of the Year, beating out teammate Lou Williams and Warriors forward Andre Iguodala. "I'd like to thank my coaches and my teammates for making my job easy this year," Gordon said during his acceptance speech. 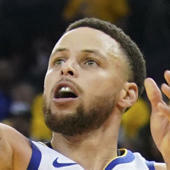 One of the league's most promising young guards before a rash of injuries, Gordon had a huge comeback season with the Rockets, averaging 16.4 points while making 37 percent of his 3-pointers. Gordon was a huge part of Mike D'Antoni's uptempo, 3-point-happy offense that was second in the NBA in offensive rating. Gordon's 246 made 3-pointers far exceeded his previous career high of 141, and were good for fourth in the league this season. He was a favorite target of James Harden, who led the league in assists. A change of scenery and a healthy season were a huge boost for Gordon, who played over 70 games for the first time since his rookie campaign.